(Nanowerk News) Scientists from the University of Geneva are using the rules of genetics to better understand how to incorporate wind and solar power into the current electrical grid to produce a renewable power system. The researchers published their study in IEEE/CAA Journal of Automatica Sinica ("A parametric genetic algorithm approach to assess complementary options of large scale windsolar coupling"), a joint publication of the IEEE and the Chinese Association of Automation. "Integration of intermittent generation into the electric network is a challenging task, as supply must always match demand," said Tim Mareda, a doctoral student at University of Geneva and an author on the paper. 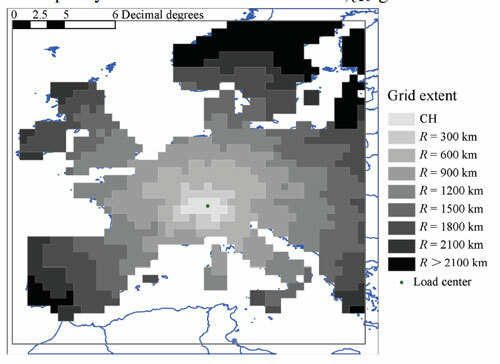 The researchers examined the problems of wind and solar power reliability, storage, and delivery to areas with high demand for power across a large-scale area, such as Europe. Mareda and his team used Europe's existing transmission map to create a grid of equally sized and spaced cells. They then simulated the mismatch between power generation and use every hour from years of electricity consumption data, and also estimated typical solar and wind generation. To process this information, the researchers created an algorithm with set parameters, including the grid's physical reach, the produced power of the renewable units, the storage capacity, and the ability of the system to charge and discharge power. Designed to optimize the power exchange and use of available solar and wind power, the algorithm is derived from biology. Genes mutate, or share information, or select a specific output, to solve biological problems. It may not be the best solution for the entire body, but it provides a good solution for the individual genes. Mareda and his group used the same principles to optimize power generation and dispatch decisions through the simulated grid system, and they found it worked well. "From a technical perspective, and within our model assumptions, expanding the spatial distribution of weather-driven power sources is an effective way to manage intermittent generation," said Mareda. He noted that his team's study results are specific to Europe, but their approach can be used to study intermittent generation in any location. Mareda and team plan to explore how wind and solar power systems could be coupled between different regions as a part of a large-scale renewable integration strategy. "Long term planning is crucial when evaluating options," Mareda said. "Distributed generation harvested from wind and solar power can expand through both locally defined integration strategies and through large-scale power system designs. The paradigms are not mutually exclusive, and all options should be carefully considered to achieve a successful transition to a fully sustainable power system."